Flatten the chicken breasts and place on a board under a sheet of clingfilm, and beat with a rolling pin or the flat of a cleaver or heavy knife then cut into neat ribbons. Combine with the rest of the ingredients and leave to marinate in a cool place for an hour. Preheat the grill, or, if you are using a charcoal barbecue, light it and let the flames die down before you start cooking, so that you don't scorch the meat. And if you are using wooden skewers, don't forget to soak them, otherwise they will impart an unpleasant charred flavour to your satay. Meanwhile, combine the sambal ingredients and set aside. 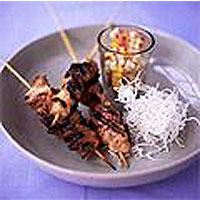 Thread the marinated chicken ribbons onto the soaked bamboo skewers, squashing them up a little to allow for shrinkage, which may occur during the cooking process. Grill fiercely, turning once, till the meat is perfectly cooked through for 3/4 minutes per side should be about right. The honey caramelises most deliciously. Serve with the sambal on the side and accompany with plain cooked rice, Thai jasmine would be ideal, or rice noodles.